This is a four day retrospective. Four days living and fishing and minutia that clogs our brains. Along the way I’ll be reviewing some Echo and Arflo products so kindly bear with me. Sidebar: Ok, maybe I was a little manic writing last night up after midnight which for me is out of the ordinary and here it is barely six AM and I go back to see what I wrote and oh-my-gosh there are a lot of syntax errors and word omissions and bad auto corrections but hey, I don’t have time to edit this thing and I’ll be willing to live with the scathing critique of the perfect writers in order to devote most of this new day to family and let this piece like most – live on in its imperfection. That said, I decided I just must go through and make a very few corrections in my once over so I’ll do this now. Whatever awkward writing that remains is intentional and is what it is. Thanks for your patience, because anyone who makes it to the end of this is going to need patience among their virtues. Day one, January 21, 2015. I fished the Town Lake with my dear friend Jack Harrell. Now this is a place where an editor or an english teacher would tease me. So, they would ask, is jack a friend or a dear friend? And how would you or anyone make the distinction between the two. How many categories do you place your friends in. Two and only two? Or do you have three, four or five categories of friends and how do you describe these? And very importantly, do you tell your friends which category they are placed, do you move them up or down in stature depending on your mood, and how should they feel when their friends status is revealed on the Internet or in a book? And do you always use descriptors to categorize your friends and if so are you consistent? Take Jack for instance, is he a dear friend one day and a mere friend the next? If so, is the distinction real or simply a matter of lazy writing on your part? Fortunately, I’m free from the need to answer any of these annoying if relavant questions and just write and let the reader figure it out on their own. And the plain fact of it all is that I have very few real friends these days partly as a consequence of being so wrapped up in my own head while fishing or writing or organizing tackle before or after fishing or shooting fly tying videos and the like that my world of friends has indeed become very small populated by the few strong people who can tolerate my intense focus (or are they foci?) on whatever it happens to be in front of my nose from day to day, hour to hour. Anyway, I got to the cabin at about 10:30 – late – because I pulled over to talk with Bob Hooton for quite a while while I was driving over to the coast. Not the Oregon Bob Hooton, but the BC Bob Hooton. It’s been too many years since I’ve seen BC Bob and fished with him and Oregon Bob. Wow, what a combo to have in a boat at the same time. But those are stories to be told another day, if I ever get to ’em. One that would be good to tell was the time I was falling ill with Hepatitis when the two Hootons and I were fishing Vancouver Island back in the 80s. I felt so bad one day that I lay down on a gravel bar in sub freezing weather to sleep, pretty sure that I would freeze to death and not caring the slightest, while the two Hootons (sometimes referred to as the Hootons-squared) headed upriver chasing winter steelhead, to hell with me. Fortunately, the fishing was sub-par and they came back before I died and they took me home. The hepatitis I had was the salad kind, not the shared needle kind, not that anyone should care but for whatever reason I can not remember the Hepatitis A, B, C, D and so on nomenclature so I just call it the salad kind. Bob is retired now, like me, and we chatted a little about writing and book publishing and then I promised to send him a copy of one of Book of Revelation and call him in a few weeks and then I was on my way to the coast again. Five minutes after I got to Woods, Jack pulled in with his yellow glass drift boat in tow, loaded my two rods while i slipped my boots on, and we made the arduous three minute drive to the lake. I was fishing two ECHO rods this day, about the fourth week I have been fishing both. The first is a most amazing cheap rod, the BECHO BASE. I fished the 8 ft 4 wt BASE with a double taper Elite super dry line and it is amazing. Honestly, if someone had put the rod in my hands and told me it was a 700 buck Winston or Sage, I would not have doubted them a second. I expected the rod to be clunky, whatever that might mean. I expected to struggle with an inexpensive 8 ft rod. I was wrong, I was astounded. I made long casts, short casts, and with great accuracy. The rod rocked in every respect. I will say that I was fishing leaders of about 12 ft and having far better satisfaction with my lay-out by adding 4 ft of 5x RIO Fluorocarbon tippet to a 9 ft 4x RIO tapered leader. This allowed me to lay out the full length of leader right where I wanted out in front of the steelhead, and there were plenty of fish for us to cast to this day. 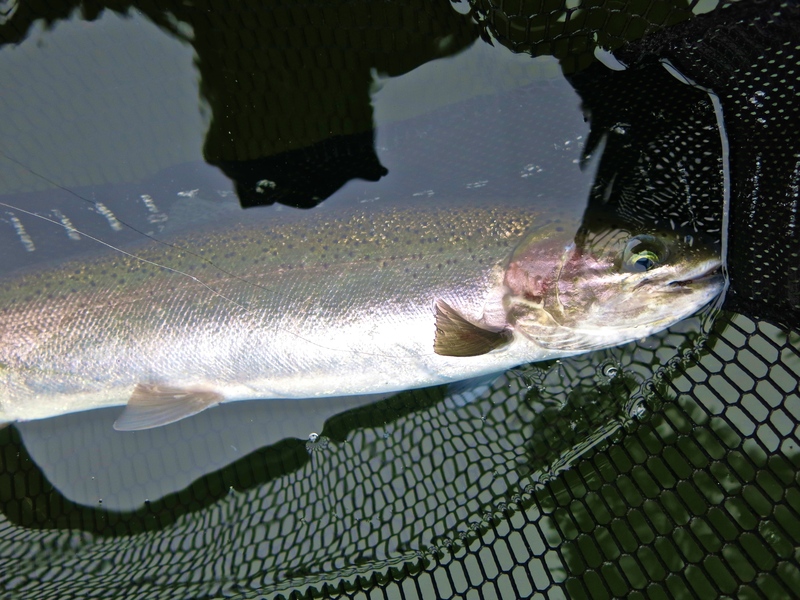 The little ECHO BASE rod has proved itself over some three dozen summer steelhead caught and released in the lake – the problem this rod presents me is that it delivers every bit of performance I could want. 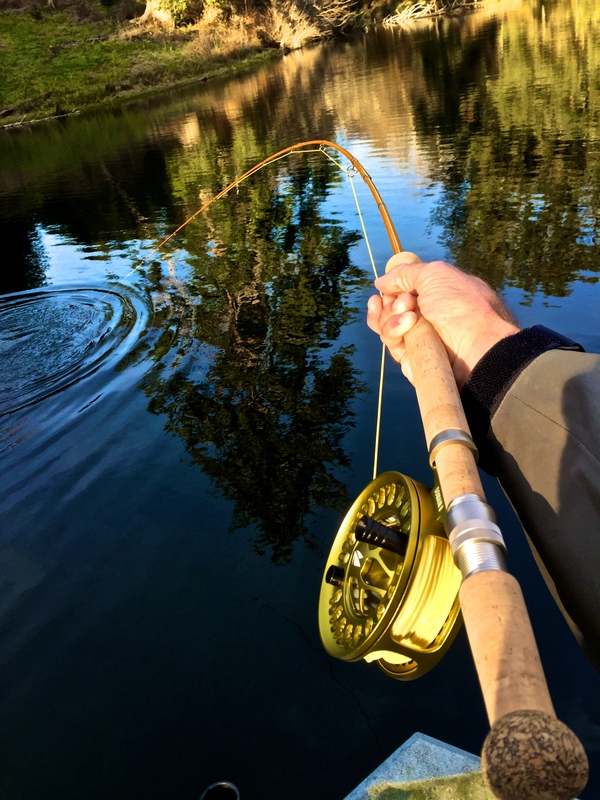 I frankly don’t know if a caster of my skill could tell the difference in on the water performance between this entry level rod and a more expensive rod, realizing that the more expensive rods have nicer hardware, but cast for cast, I felt like a superstar. Anyone who want a starter rod or a backup can not possibly go wrong with the BASE. Full warranty. 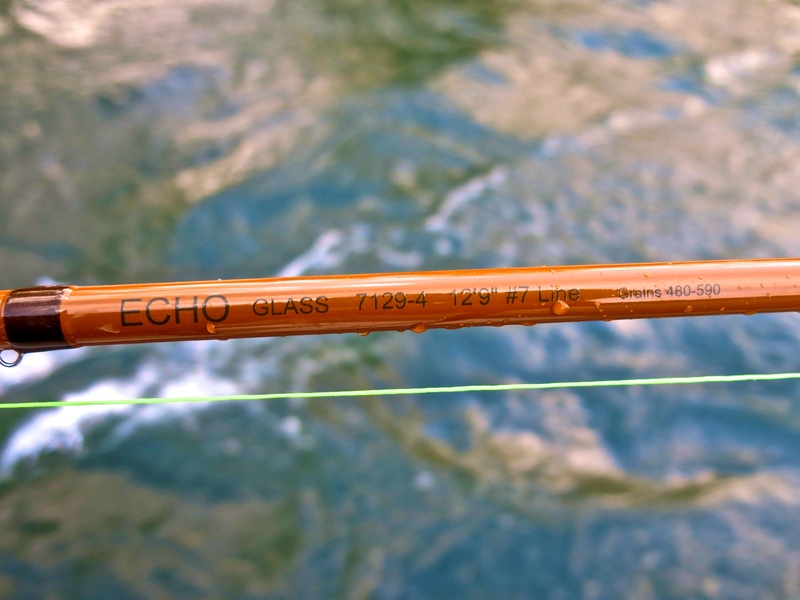 The second rod I fished was the 3 wt ECHO GLASS Switch rod. At 10 ft 6 inches this is a wonderful rod I am going to put into action a lot in whatever future I have remaining. 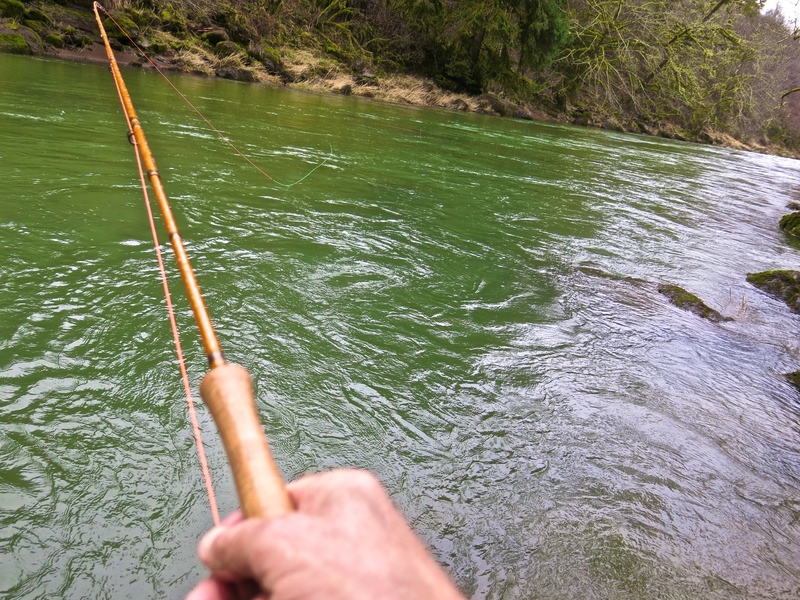 My inspiration to get this rod was actually a desire to fish the lower Rogue with another dear friend, Steve Jacobs, who I had coffee with a few weeks ago. I had not seen Steve for close to a year and he had pretty much written me off as missing and unaccounted for. I begged his forgiveness and I think he granted same. Anyway, he told me how he had experienced most excellent half pounder steelhead fishing in 2014 (I think around Agness), fishing a Tim Rajeff two hand 7 wt spey rod. Well, I was thinking that rod was about four times over the power one should be fishing for cute little silvery fish about the size as a first-run blueback and what he needed was a little 3 or 4 wt switch rod to make those long swings in the lower Rogue instead of a powerful full-on Spey rod perfectly capable of subduing chinook and hefty winter steelhead. I also got an ECHO 7 wt GLASS Switch rod rigged to fish and took it out onto the lake to try my hand at spey casting, which was Ok but not so great and I figured out I would do better the next day when I was fishing in a river instead. 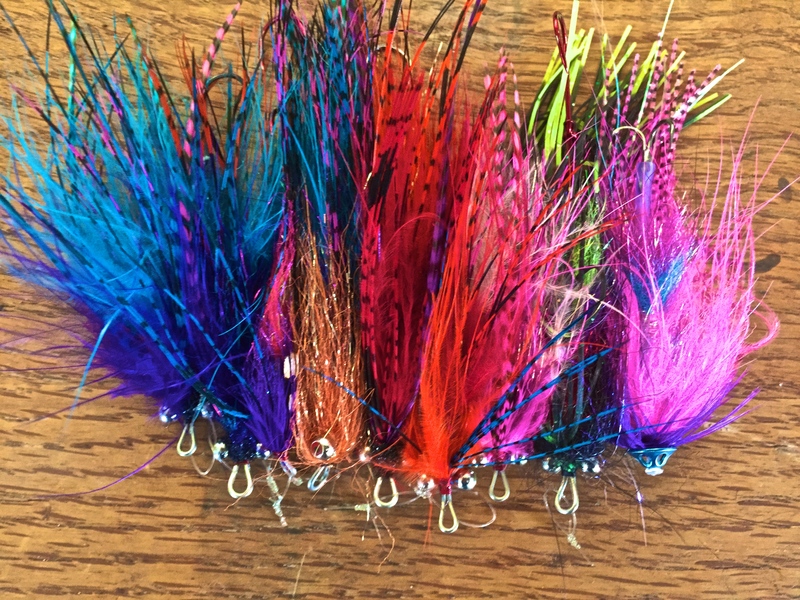 I can tell you that an Intruder is not the fly of first choice on these lake acclimated summer steelhead but I got a few photos and got back to serious lake fishing for spooky fish on light tippets. I’ll pretty much let the photos speak for the GLASS two hand and switch rods. Exquisite. Feels good. Looks good. I’m not one to pay much attention to finish and components on fly rods. I demand performance and these rods deliver. So I got my little 3 wt GLASS Switch rod and fished it in the lake with a 5 wt DT AIRFLO Elite line and again (sounding trite and repetitive I understand) this rod is a winner. My first surprise was the ability to cast long and accurately with a rod that has such deep flex. 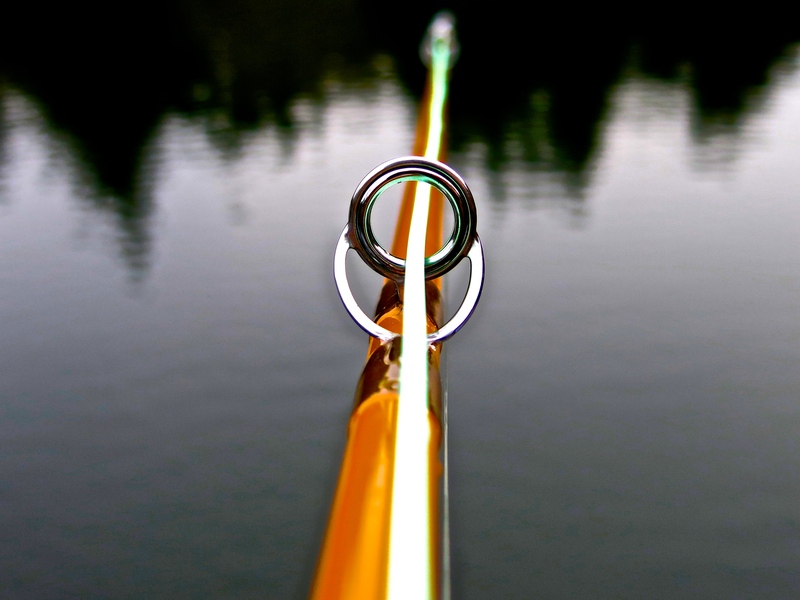 True, if I don’t pay attention, the rod will put the fly exactly where my hand guides it, and if I’m being sloppy, my fly is as likely to land ten feet behind the silly fish as the 4 ft in front where I would prefer to place my fly. But when I do my part, this long rod allows me to reach far out over the lake and lay a fly (sometimes a #8 glass bead bugger and sometimes a size 18 Griffith’s Gnat) just where I want it. And fun to play fish on? Zounds! I love the flex of the long slow glass rod. Fact is, I’ve panicked and broken- off several steelhead on the 4 wt BASE but I think the greater range of flex in the GLASS saved my tippets when my head was telling me to pull harder than my leader should have tolerated. 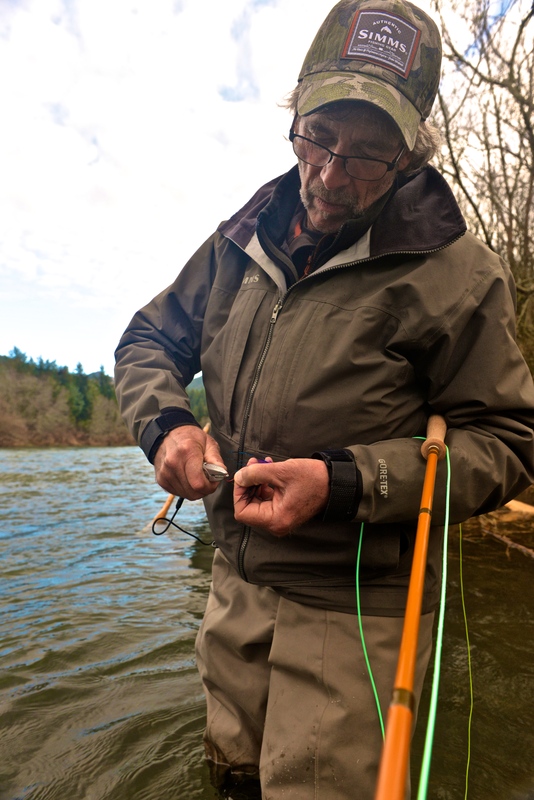 Close to three dozen summer steelhead have blessed this glass switch rod. I am anxious to take it to Hood Canal in the next few months to fish sea-runs with Guy and Jim, if I get my courage up to travel that far from home. 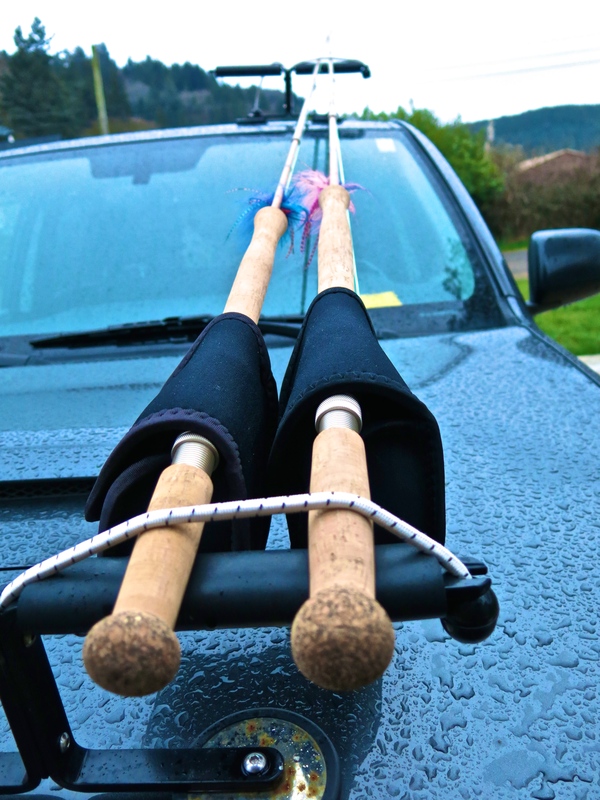 I think this will be a great beach rod for sea runs and then if I make it to half pounders on the Rogue in August, well that will be icing on the cake. January 22nd. 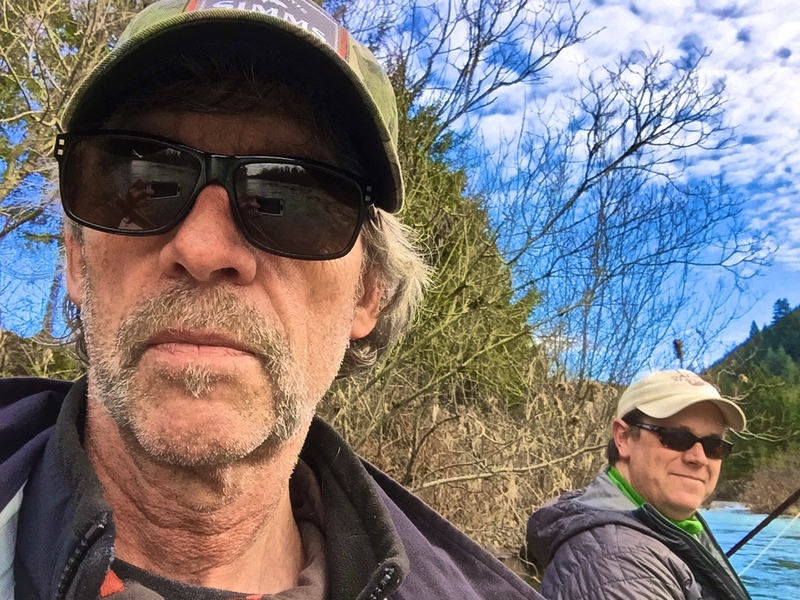 Finally, I got to fish with my dear friend RR (keep ’em all on a level playing field, huh?). Rob came over to the cabin the previous evening (I know the dates can get confusing and all but …) and I didn’t take my evening meds until after ten PM and we talked and talked like we needed to catch up and why the heck we hadn’t already but I was sort of in hermit mode for the bulk of 2014 and Rob understood and eventually we watched a sci-fi movie that I had already seen four or five times and Rob sort of got it but also missed the point partly and it was midnight by the time it was over and by six AM I was still on the sofa and all groggy but we made coffee and went to the “rich people” coffee shop near Kape Kiwanda and picked up a turkey sandwich to split for lunch and I followed Rob to the so-and-so river where he was sure that conditions would be perfect and they really looked good to me and we slid his boat into the river or actually he did all the work and uh-oh here I go forgetting to use punctuation and real sentences and all so I’ll stop for now and catch my breath OK? So Rob was right and the so-and-so river was perfect but guess what? Rob got pulled four times and caught two trout but I got only one little tug from a trout – no it was two tugs and yes I am sure it (they) was/were a trout and not steelhead unless it was a steelhead or two steelhead. But probably not. I was equipped with seven wt ECHO GLASS long rods, the spey at 12 ft 9 inches and the switch at 11 ft. 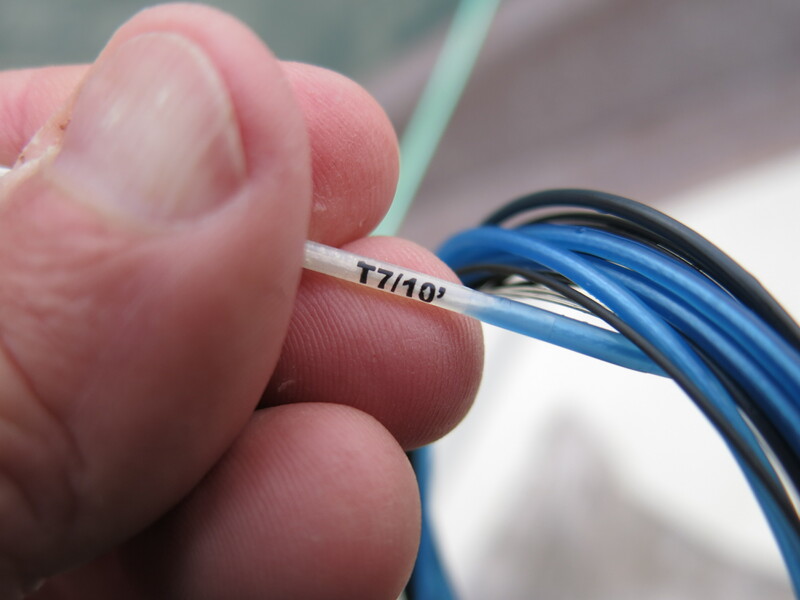 The switch was rigged with a 450 Skagit Switch line and AIRFLO T-10 FLOW Tip. 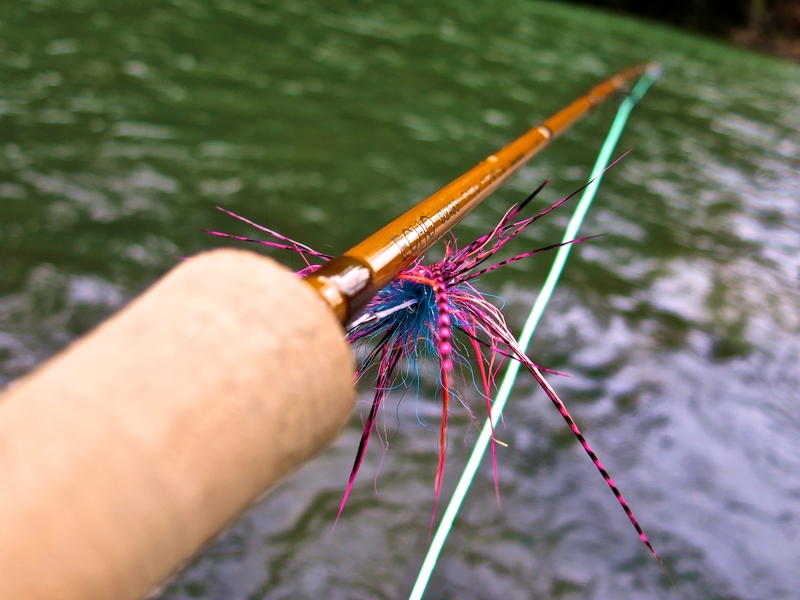 The Spey rod was rigged with a 510 gr Skagit Switch and Y-14 Flow tip. For me, the both rods were dialed in just right. I did a lot of casting and swinging from the boat because my right knee is due for replacement, the tendon tear on my left foot is still a mess, and my balance is horrible. Excuses aside, standing in the front of a drift boat makes me shine as a caster, and I was happy to let Rob wade ahead of me through a run and follow him in the boat. Towards mid afternoon, Rob anchored and assured me that we were in a great place for me to wade fish. So I got out of the dang boat and made my way down the river in water deeper than I was entirely comfortable with but my casting stayed strong and my flies swung well and at one point I really thought I was going to get pulled but no such luck but it was really really good for me to be wading and Rob – thank you Rob for getting me out on the river and wading again. Soon, we’ll fish again soon. January 23rd. Lisa and Jackson are going to join me at the coast today. See, I’m mixing my tenses and being a horrible writer but sometimes I write like it is today in these journals even though today is really the 24th. But I’m gonna do it anyway. Fresh from my wading victory of the previous day, I strap my GLASS rods on the 4-runner and head upriver from the Cabin to fish the such-and-such-run, a place that is only thirty minutes from the cabin. The practice of never mentioning the rivers that we are actually fishing is part of a steelhead tradition that I have been taught by my most serious steelhead fishing friends. 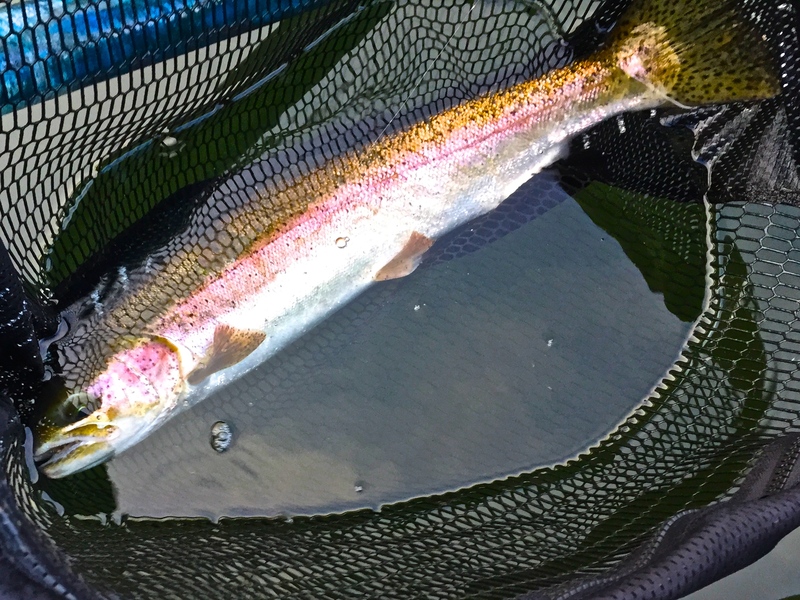 It seems silly to me at times, but apparently if I were to mention wade fishing the upper Nestucca River, such mention would cause approximately seven hundred fly anglers to beat me to my favorite two pools before I could get there on any given day. 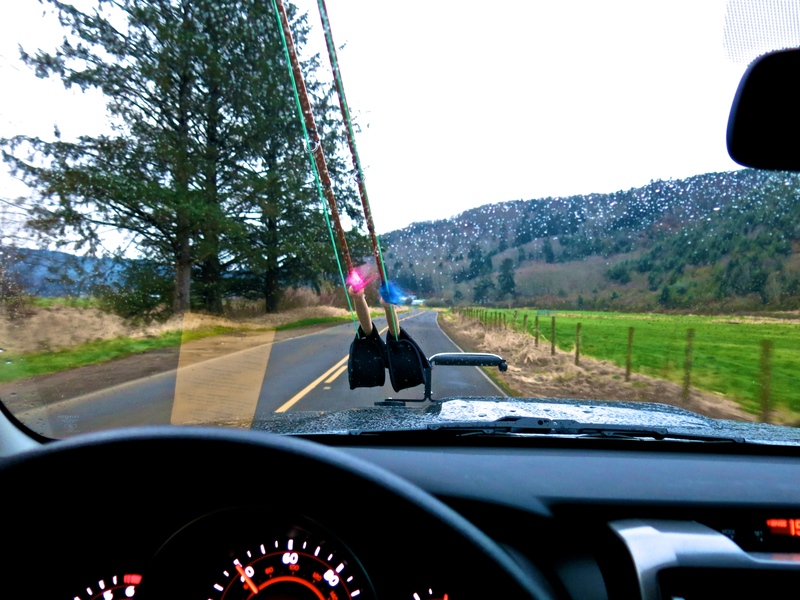 Driving upriver in a light rain, I learned that this superstition is more than silliness, because when I arrived at the turn-out near the big fir tree at the tail-out of the most perfect steelhead pool you can imagine, I found an unauthorized fly angler stringing up his rod. I pulled in beside him, said something nice and considered hitting him over the head with my wading staff and taking first water. Then I considered just getting out of the truck and running down the trail to the river and fishing it first, because after all, my rods were already strung and who the hell was he to be parked here anyway beating me to the place I wanted to fish a mere few minutes earlier than me. But I smiled and drove upriver a little way to another perfect steelhead run, grabbed my rods, and headed down the easy trail to the river. I fished through the run with the GLASS Switch and T-10 Flow tip first, then went back through with the Spey rod and T-14 tip. 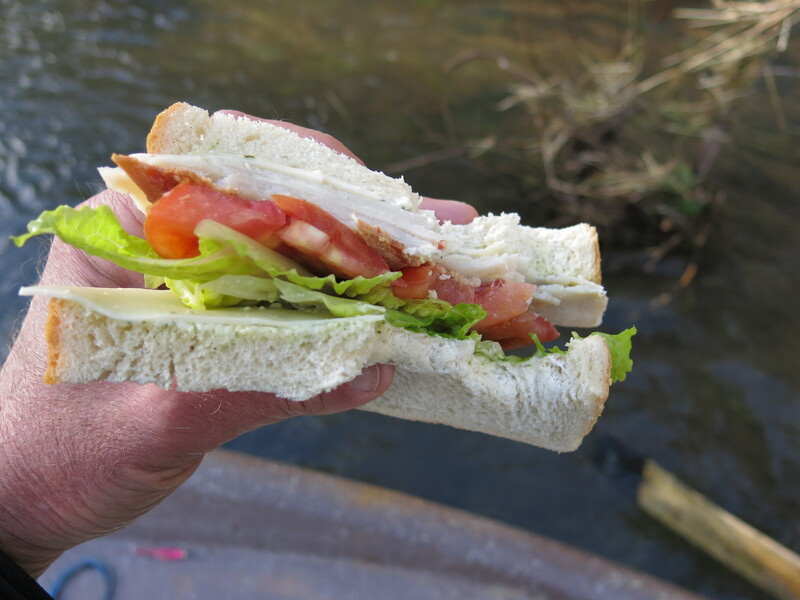 Perfect water, my presentation and flies were awesome, but no tugs followed. I headed back to the cabin and arrived there at about noon. Lisa and Jackson called and told me they were still a few hours out, so I backed up to my Koffler 14 ft RMTB, exchanged the seven wts for my 3 wt GLASS and BASE, and headed up to the Lake. 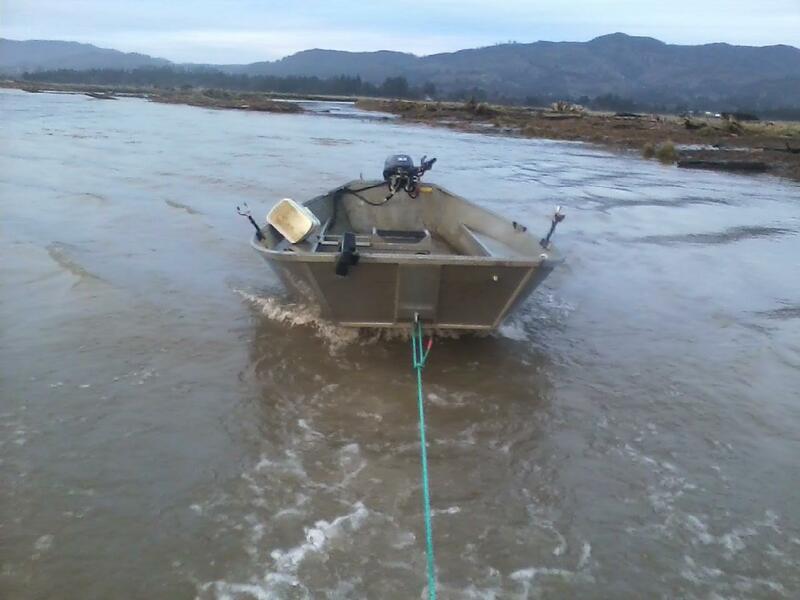 Oh yes, I left my steelhead flies at the cabin, got out of my cleated boots, shed my SIMMS stocking foot waders, slipped on my chore boots, grabbed my SIMMS boat bag with my trout flies, and off I went. Three minutes from the cabin, I slipped my boat into the lake. 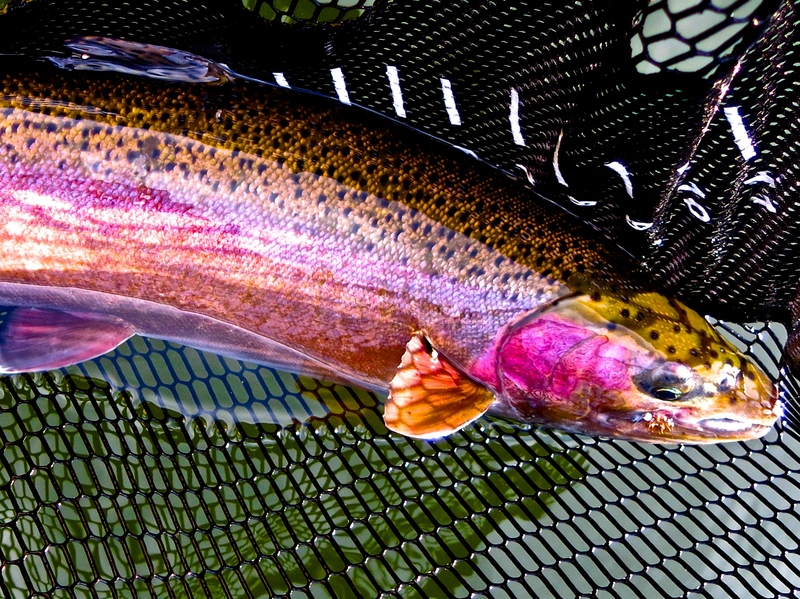 Two and a half hours later I had been rebuffed by close to a dozen summer steelhead. Some spooked as my line came close to the water, some came to look at my fly and then ran away. A few followed my fly and then turned aside. Rowing toward the ramp at 3 PM, I spotted a shiny bright steelhead laying on the other side of a log. I eased the bow anchor down, picked up my rod and made the cast. Oooops. The size 12 glass-bead brown bugger landed ten or twelve feet to the right of where I intended to place it, across another submerged log. I know there was no chance the fish would take my fly. Something caught my attention off to the right from the fish. I looked away. When I looked back, the steelhead had moved forward to were my fly landed and was gliding to a halt. Somewhere in my pea-size brain, I knew the fish must have taken my fly. So I pulled back and sure enough, there was the head shake and big silvery flash. Several jumps, a quick net and release, and I was back at the cabin a good two minutes before Lisa and Jackson arrived. January 24th. Family day. In the last hour of daylight, Jackson and I headed out to the lake at 4 PM. We had an hour to fish. Most of the steelhead I spotted ignored or ran from my fly. Jackson kept me company and texted with his friends back in the Valley while I talked to the steelhead. One fish cooperated and came to my fly near the Dock, and that made for good entertainment. 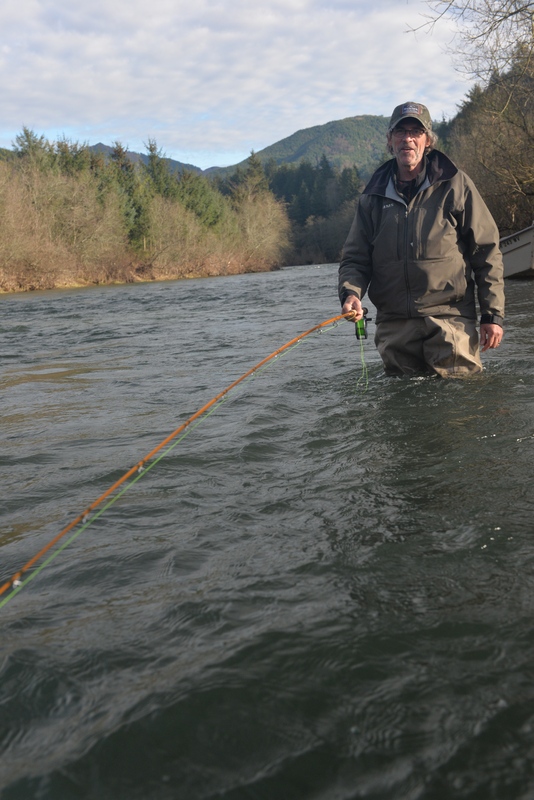 I overheard one angler say that he had kept a steelhead earlier in the day. I fished right up to dark and had one other fish follow but not take my fly. The water was dead calm. I may fish the lake a few hours tomorrow morning before my family is up and ready to go for the day. I need to deal with the insurance company and figure out how much it will cost to replace the gear lost when my boat sank last month. 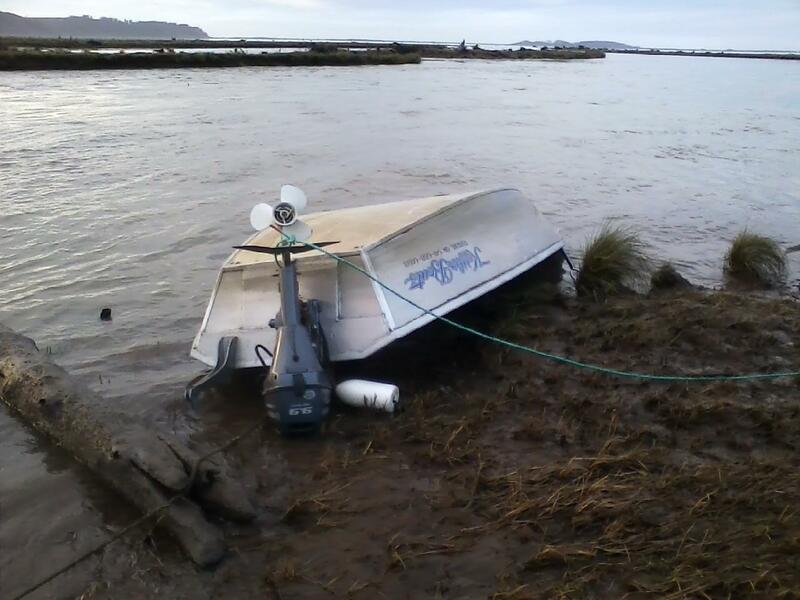 Greg’s Marina will reopen real soon and I’ll get my back-up RMTB back in action to fish in the Tillamook basin in the next few weeks. We’ll all head back to the valley tomorrow. I have revisions to make to a new book and push it out the door. 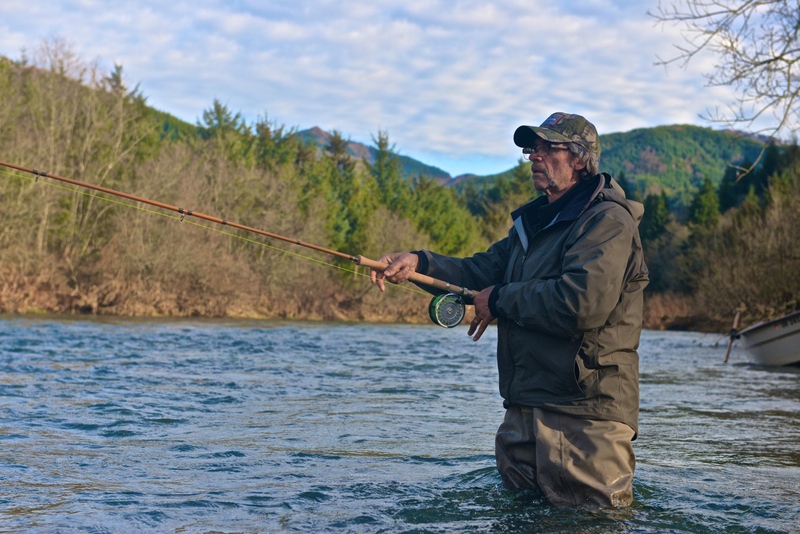 Almost forgot – Gary Palmer interviewed me for a podcast on Fishing the Oregon Coast. Gary apparently found my book SEA FLIES on Amazon, ordered the book and is not looking forward to fly fishing in the ocean this season. 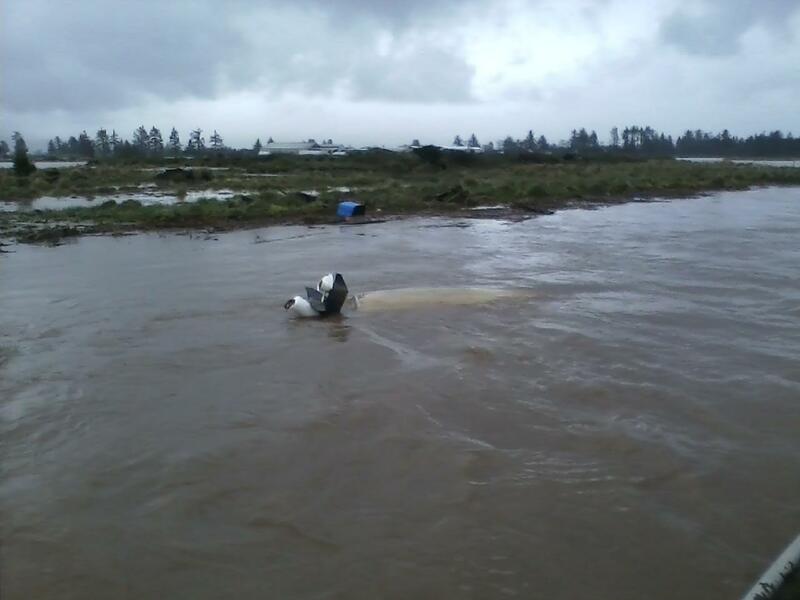 You can listen to the podcast by clicking here – Jay on Fishingtheoregoncoast. You can find the book SEA FLIES on AMAZON. 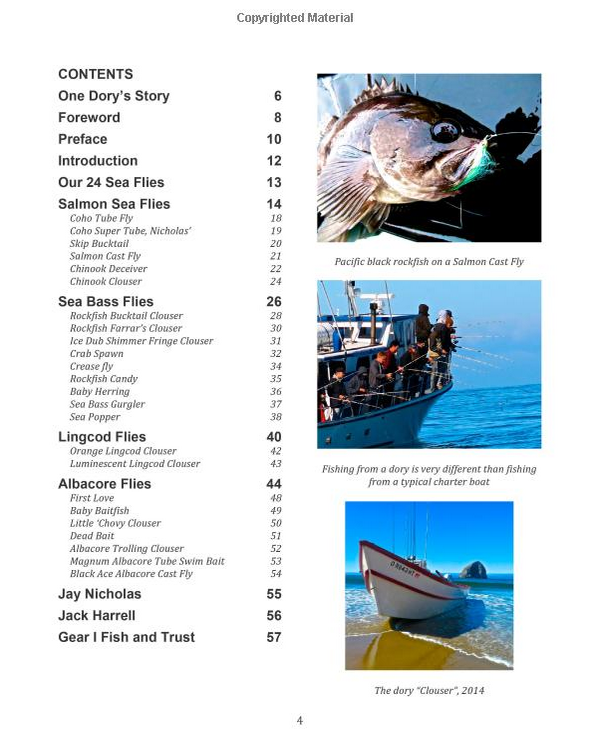 The contents page is shown above. About the product reviews: Those of you who know me understand that I fish all brands of gear. Well, not all brands, because that would be crazy. 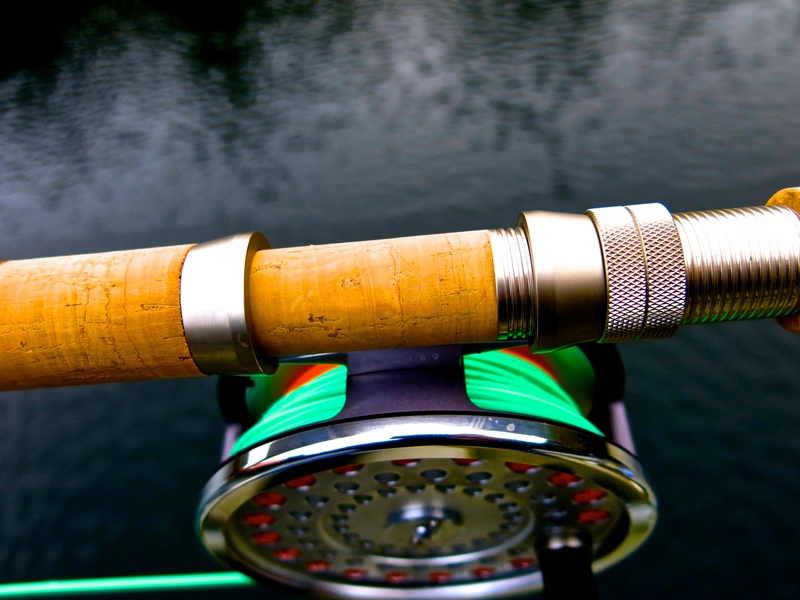 But I fish rods reels lines and leaders produced by many manufacturers, because I like to know what is out there, experience a little of it, and be able to make mental comparisons and recommendations to people who ask. 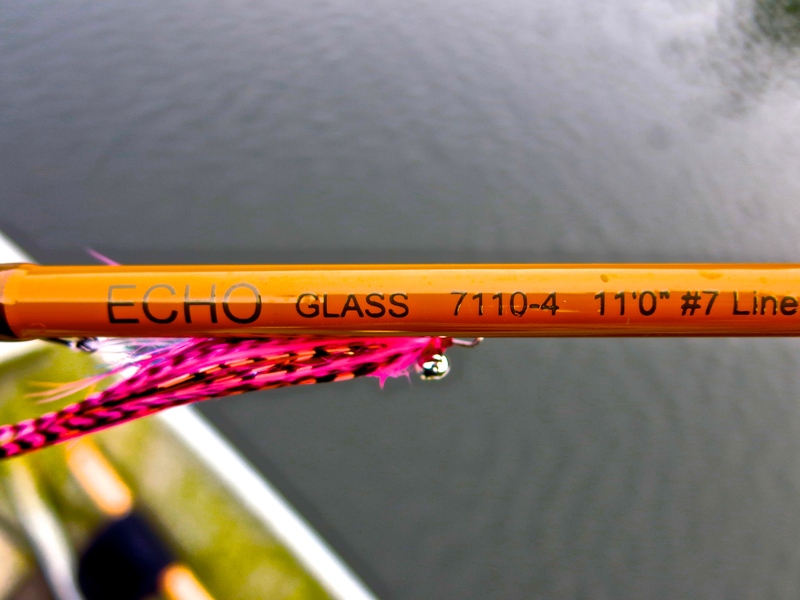 Here is my nugget about the new ECHO GLASS two hand and switch rods. They are excellent casting tools. Extremely intuitive. Their action allows me to feel the rod load and execute my cast very well. I have yet to “fight” a steelhead on the 7 wt two hand and switch rods, but judging from fishing them and from fishing the 3 wt switch rod over roughly ten days and three dozen steelhead, I am sure the seven wts will be a blast to have between my hand and a fresh steelhead at the end of my line. SAGE DOMAIN FLY REEL. 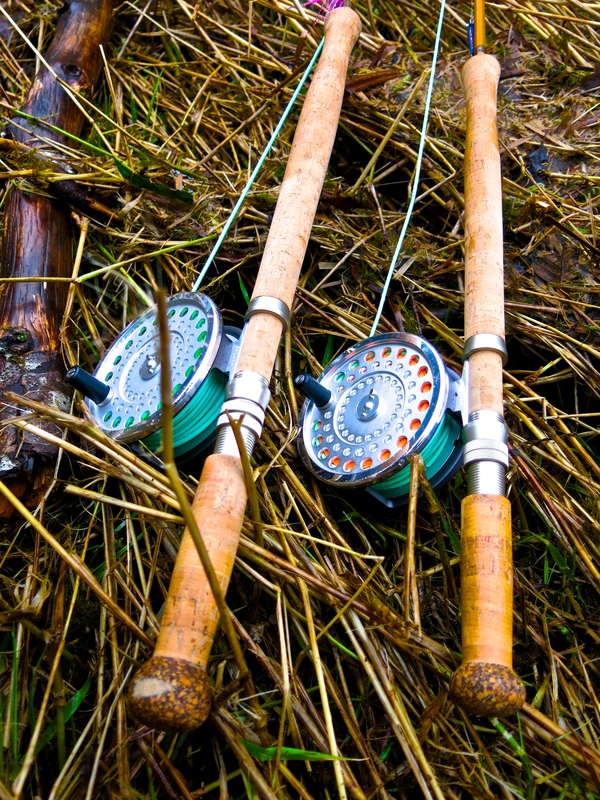 Listen up, I fish a lot of great SAGE rods and reels, so don’t dismiss me as a brand-blind guy who can’t recognize good equipment – regardless of who makes or sells it. 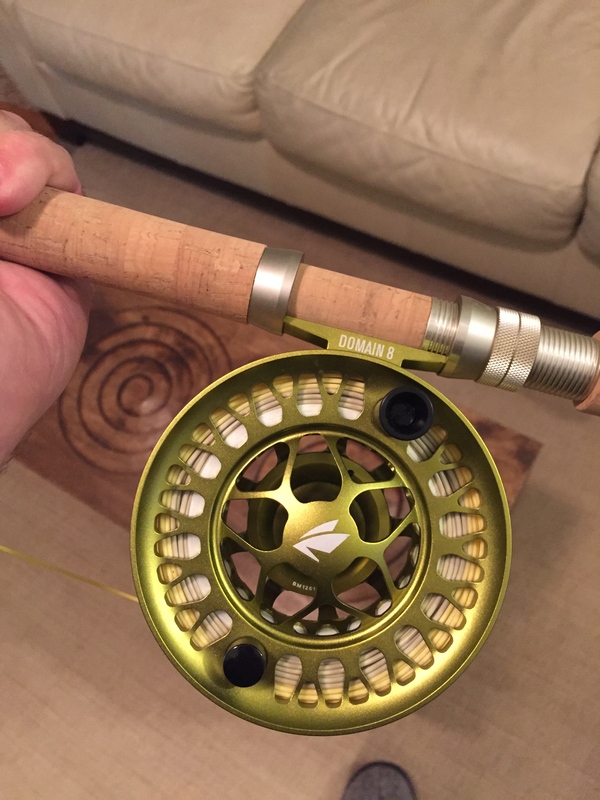 Anyway, about three years ago, I spoke to George Cook the most highly respected SAGE sales rep and dear friend, asking why on earth there are so few full frame fly reels on the market and venting my frustration about getting my shooting line caught and generally fouled up in the frame of so many high price fly reels. George told me the consumer had demanded the exit of the full frame reel in order to make reels lighter and lighter and I should get over myself. I said no, I wanted to see more full frame fly reel options because I was continually frustrated and asked him to consider my request and input. Less than a year later out comes the SAGE DOMAIN in a full frame configuration. Now I’m not an expert, but I bet you five fly lines that George knew full well that SAGE was going to release the DOMAIN at the same time he was shoveling crap on my head about how full frame reels were dead in the water and had no future. 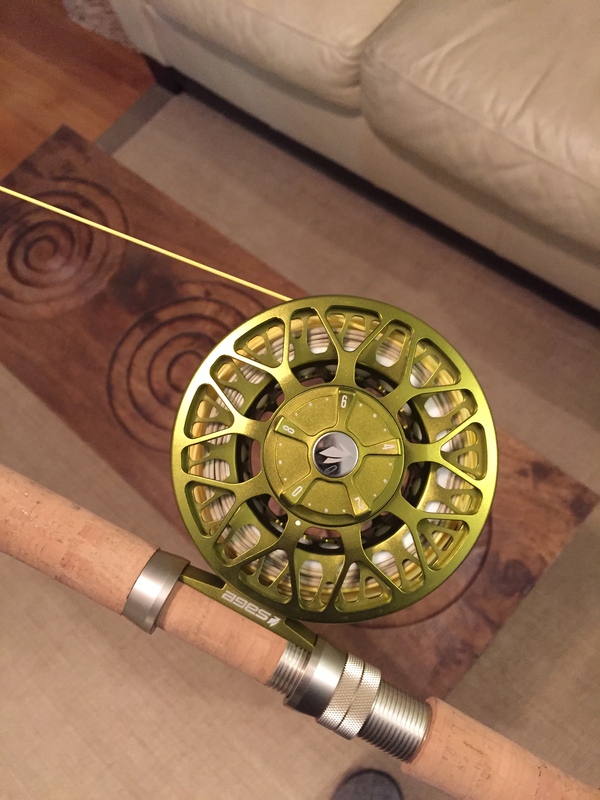 He may be right, but I for one really love this fly reel. The drag system is decent, and the full frame is incapable of letting my shooting line get jammed and fouled, and this is a wonderful feature. The reel has a magnetic spool securement system that is not familiar to me but has performed well for a full year fishing chinook and now for several dozen lake bound steelhead. I recommend ECHO GLASS two hand and switch rods to anyone who fishes long rods. 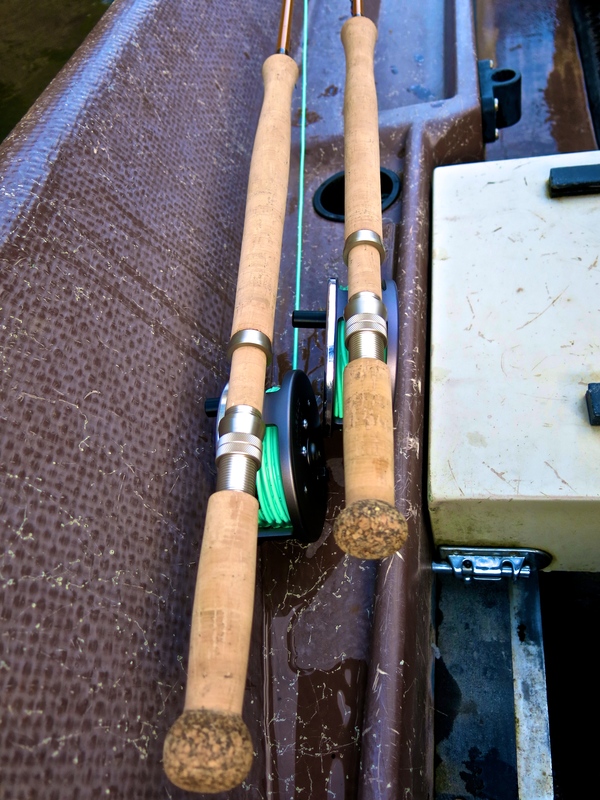 If you are already an expert, you’re going to want to see how well these rods perform. 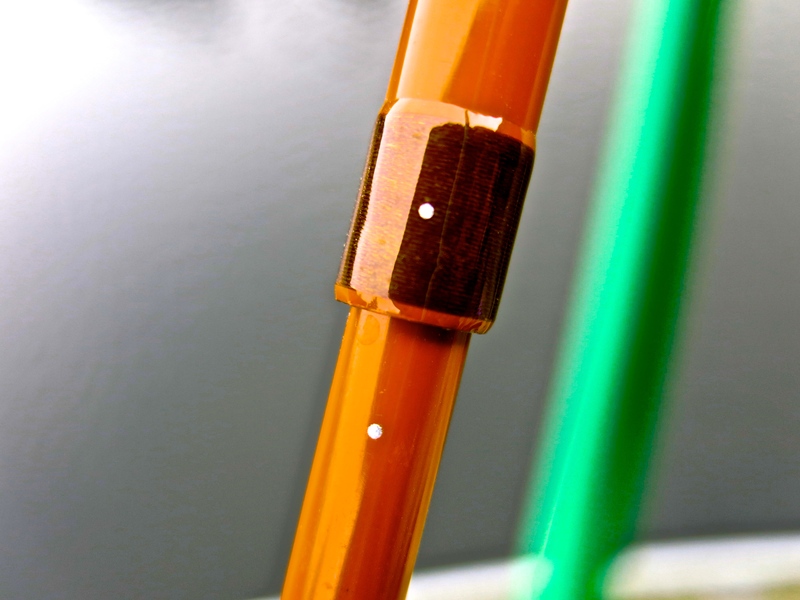 If you are a beginner, I believe that you will be able to learn to spey cast very quickly with these GLASS rods, because you can feel them load and unload so well. Components are subtle and elegant. The rods look great, cast well, and feel good too. Price? What a bargain. Post script that people may or may not ever see: It is nearly 7:30 and I’ve been picking though this post to clean up and add a little here and there. The sun isn’t up yet but I can see the Dairy farm across the gravel road and Duke, the giant friendly doberman puppy that weights about two hundred pounds has been on the deck to say good morning and NPR is droning on about some socially revenant issue and my family is safe and snoozing close by and I think it is time to heat water for decaf and I’m thinking about a few hours on the lake today and then all of us getting back to the valley and working on a new book and I need to get some photos ready for when I’m at Joel’s Royal Treatment Fly Shop to talk about ocean fly fishing and yes I guess I’m going to be productive as ever in the next few days. Life is full of surprises. Thanks for your patience. January has been a great month so far and I expect 2015 to keep rolling along. My boat sank in December but my dear friend Jimmie salvaged it and with a little work at Greg’s marina in Garabaldi it should be back and good as new for the 2015 seson that is beginning to unfold. Fortunately I have a second Koffler Rocky Mountain Boat just like this one, because this boat is still sitting at Greg’s pending repairs and such, and I needed my twin boat to fish the Town Lake last week. 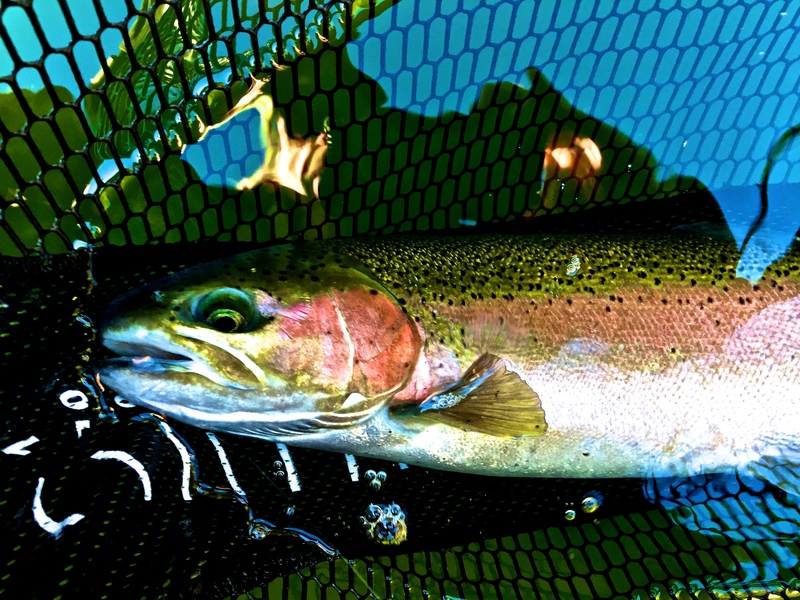 I caught some very nice hatchery summer steelhead on small wet flies fishing with Jack Harrell, (Pacific City Fly Fishing) usually with Jack doing the rowing and coaching me casting to the fish we spot. A new ECHO GLASS Switch and SAGE Domain reel were a pure joy to fish and I may write more on that later but may be too busy fishing so for now, just know the #3 ECHO Glass Switch rod with the #8 SAGE Domain are a great pair. I’m excited to say that I now have 8 books on Amazon, and will soon have number 9 published in the next week or so. The next book will be Intruder Essentials: Tying Tube and Shank Intruders for Steelhead, Salmon, and Trout. 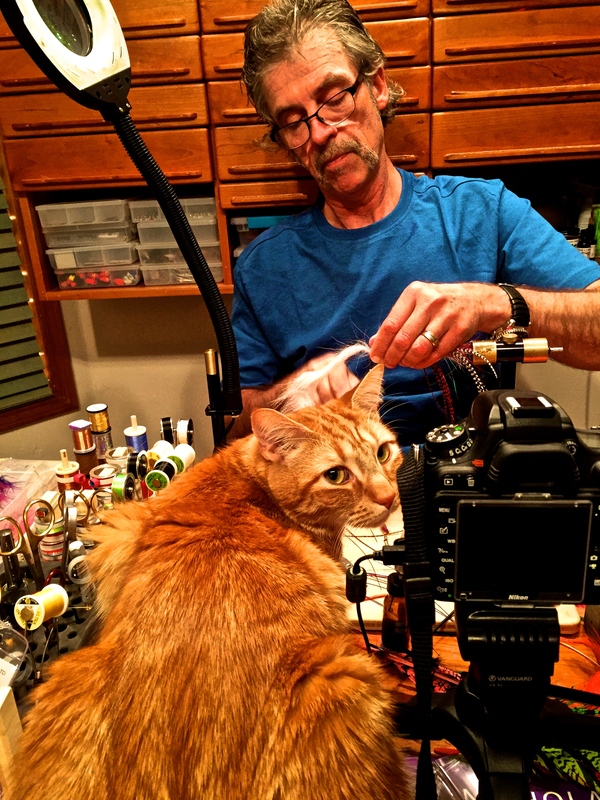 Here is one of our fine cats, Boomer, helping during production, and one of the flies that will be featured in the new book. 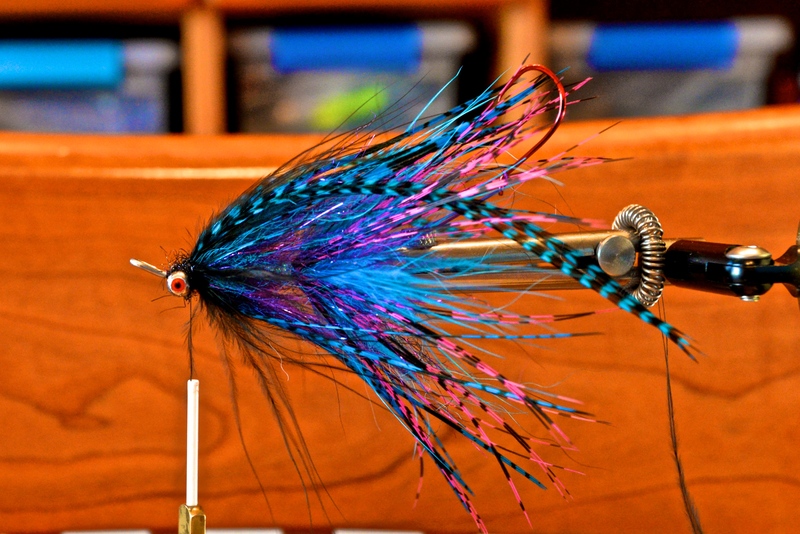 I’ll be up at Royal Treatment Fly Shop with Joel La Follette in February. This will be fun and I’m still working out of the hermit mentality I was in during so much of 2014. I’ll have about an hour or so to present photos and maybe some Go Pro footage of offshore fishing, talk about tackle and tactics, make up stories and pretend that I caught some fish, and generally have fun. Ill tie flies that afternoon, concentrating on saltwater flies and trying to sell a few books to buy gas and replace gear lost when my boat sank. Ha ha. I’ll have copies of the Intruder book, co-authored with Thomas Rangner. Tom is a young man who brings fresh perspective to my decades of blah blah blah and he’s the dude who will be creating a DVD of Intruder tying hilarity to add to the Nicholas fishing book portfolio. Speaking of portfolio, I have posted a few of my sketches and photographs on Fine Art America, and you can see these by clicking here. Oh still thy beating heart! Now you can order a throw pillow with a salmon or a dory or a bent fly rod on it for a most reasonable price, not to forget canvas, framed prints and such forth. No sales yet, Probably a scam for all I know. Greeting cards anyone? Enough blatant commercialism for now. Forgive me. I’ll be fishing in the next few days again, maybe for freshies as the water drops back into shape. Got me at least a hundred Intruders created as part of shooting the next book. Wishing you all the best and I’ll be back soon.